Now onto the knitted goodness. The koigu socks are finished and gore-gous! On top of that the Holly jacket is nearing compleation. It may need to be shrunk a little but whatever at this point yayness is in order. I understand the lack of pictures to this post makes it less monumental. 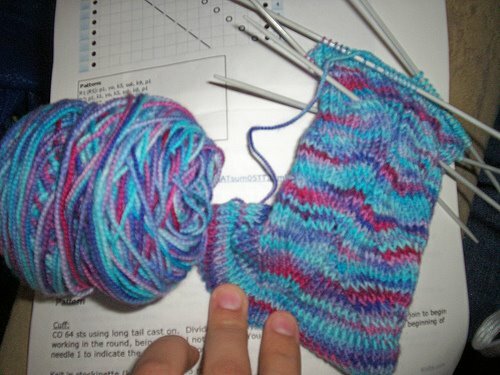 I have started auntie donna’s socks. Hopefully they work up fast. Since the papers have landed. I Know I haven’t been posting much, what can I say six papers in two weeks and finals to boot (I question my sanity daily). But here is Nutkin which I started in the Koigu, it’s goregous. And the pattern is fabulously easy to memorize. It’s the perfect sock pattern, I’m putting it up there with the Monkey socks in my mind. 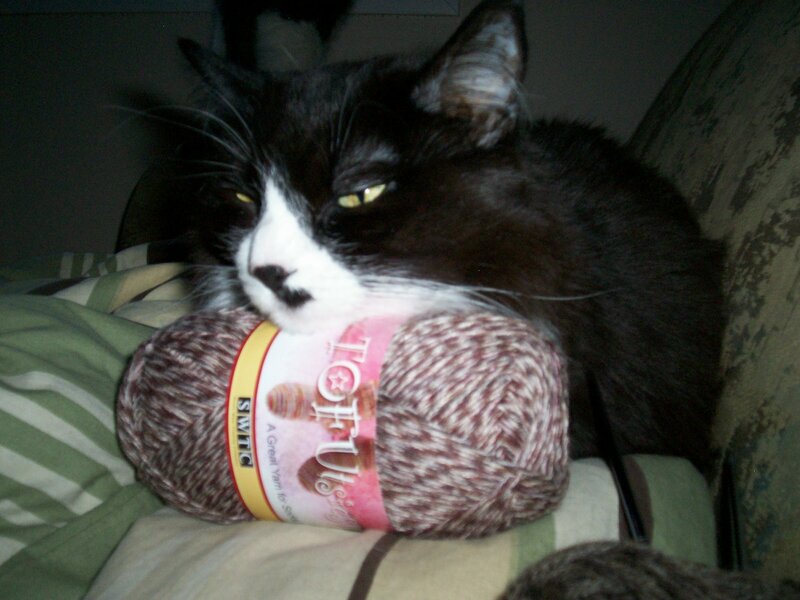 Until the storm is over I bid thee good knitting. 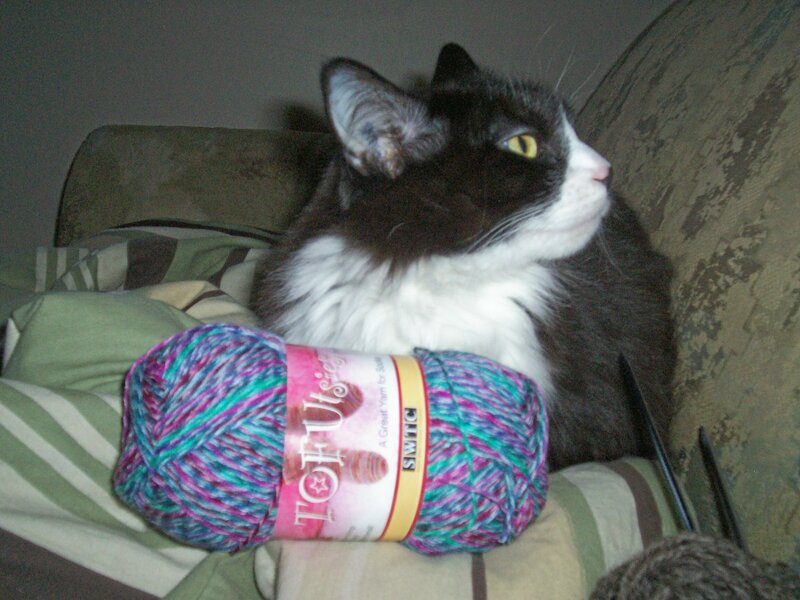 Mom got this kit so I could knit it up for her. It’s definatly a mom thing. The color is actually a creamy beige and very shiny. It should be fun to knit, the pattern itself seems easy which is nice since I have little brain power at the moment thanks to finals+papers season. Okay, so mom went to help auntie Donna and uncle Mike move to B.C. 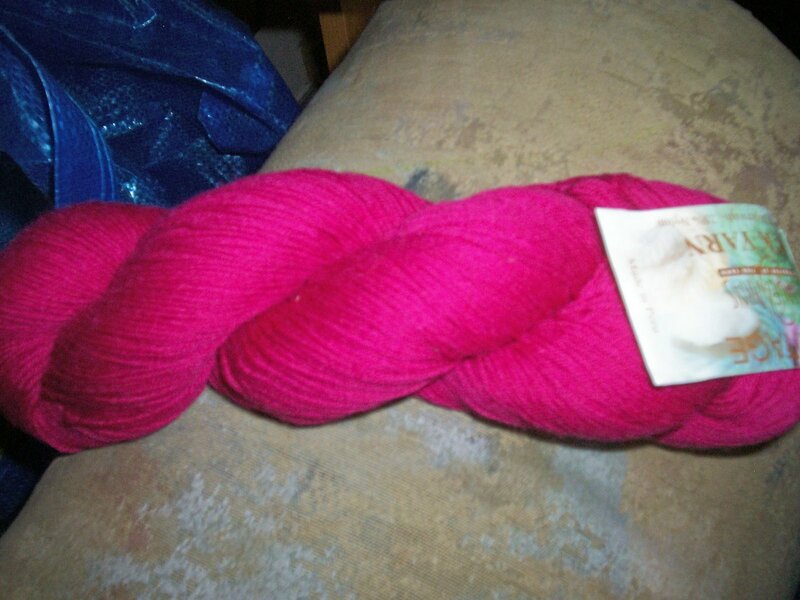 and since i was under the influence of the mutant flu from hell she brought me back some yarn… okay a shwack load of yarn. So in order of appearance. The fuschia cascade heritage. Followed by beatle modeling the lovely Tofutsies in a browny/tan colorway, she really liked the tofutsies because they smell like cat treats to her, not that I can smell it but I could tell she was impressed. I think she’s made the Tofutsies her fave, I have yet to knit with it but I am excited since it’s something we don’t get here in Regina town. 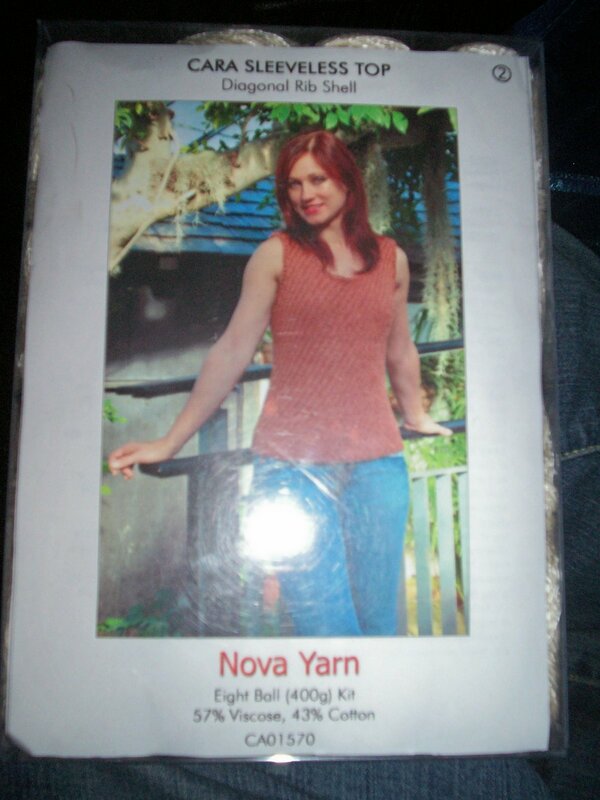 The colors are interesting, I shall have to find an adiquate pattern. I’ll surf the net and check the books I have around, I may just go with a traditional sock to see how the colors work. 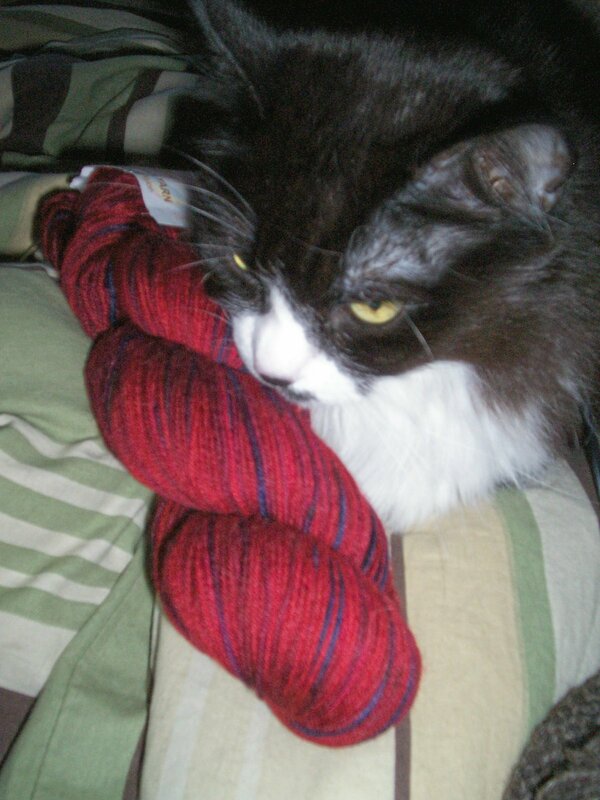 The verigated Cascade Heritage in a lovely red/wine and blue stripe kind of colorway, again modeled by Beatle (in fact all yarns seem to be modeled by her, but how could I resist the photo-op. 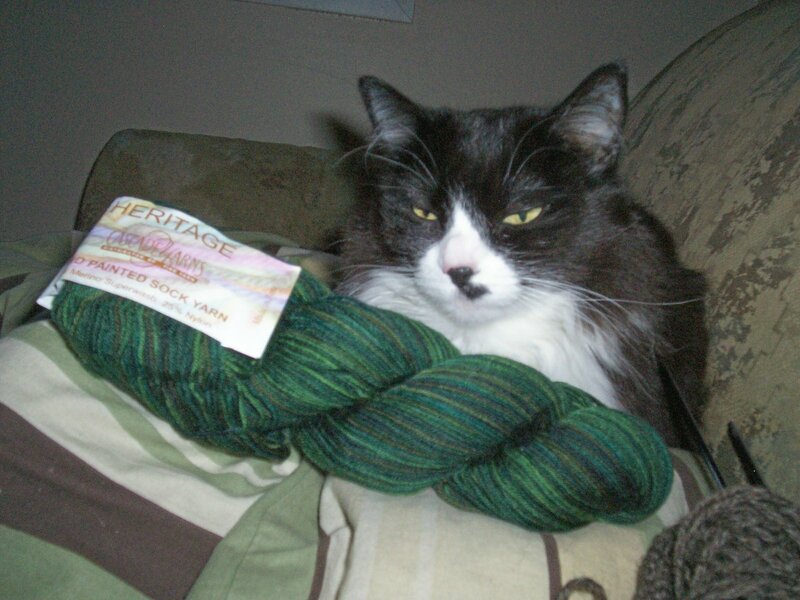 She didn’t much mind and liked sniffing all the yarns so I take it as a win win situation. These colors seem indicative of my mother, perhaps she is trying to tell me something… perhaps she wants a new pair of knit socks…. 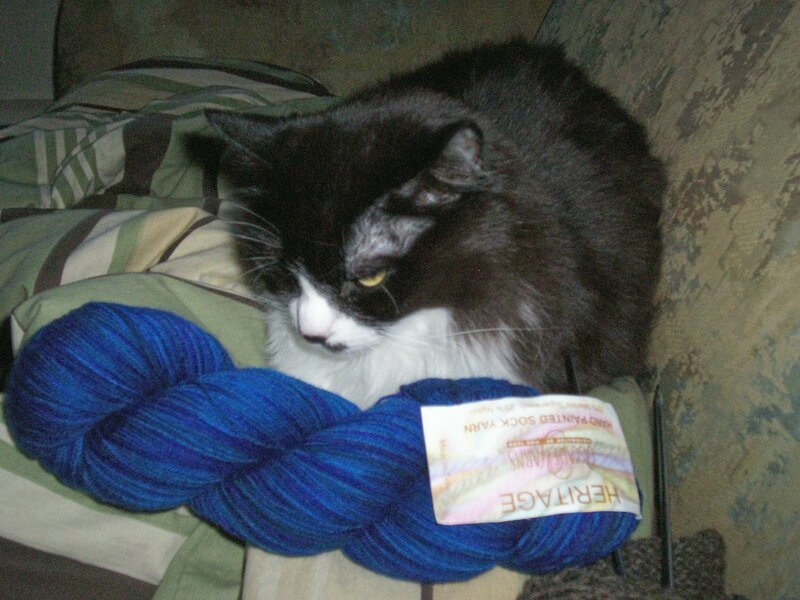 The blue is for Auntie Donna, she bought it and sent it home with mom for another custom pair. If i keep this up my whole family will become addicted to the greatness that is the knit sock. And then Stephanie Pearl-McPhee will truely be proud. Here we see the shaded green cascade, reminds me of a forest, I am tempted to do Baudilaires (by cookie a) with it. It’s definatly muted enough to support an intricate pattern. And this is the other set of Tofutsies that was gotten. I like the brightness of the colorways. Again Beatle would like to express that she is fond of this particular stuff.